Blogging field is a rising sunshine that never rests. The craze for blogging will always be in every webloggers and it will evolve its growth through their blog appearances and its quality accompanied with quantity. Only the content you are providing in your blog post is not enough if you want to reach more people. The success of a blog not only lies in the quantity of the posts but also rests its main platoon of Appearance and Marketing. Some may have a wrong thought that only quality content with rich wordflow will reach more readers and get more appraisals. Unfortunately, along with the quality content, some promoting makes sense to what you write and also will reach more people. Down here are the most important 7 things you should include in your blog to get more stable and frequent readers. Identity is the foremost thing that needs to a blog. Being Anonymous you can post whatever you want but you won't be getting stable readers. When you link your social network profiles to your blog and let people know about the blog, it will increase your blog's identity more that it would get more stable readers. I assume that you all have your own accounts on social networking sites like Twitter, Facebook, Google+, LinkedIn etc.. If not create one in all and make sure you use it professionally for your business purposes. Link all those profiles to make awareness to the readers that you're the author of the blog. As of Today, with more than 400 million tweets sharing a day, Twitter is a powerful tool to promote your blog. Make use of all its functions that will help you gain your crowd that listens you. Read about How to make use of Twitter for blogging. Tweet API plugins are available on Twitter. All you have to do is copy and paste the code in your template page of your blog. Also embed your tweets to your blog at the bottom or may be at the right sidebar. It will show the latest tweets shared from your Twitter profile to your blog. This is a way to increase your credentials as a blogger. 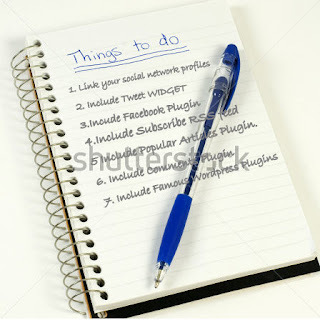 Now, we had done 2 things and the next to do is to get a Facebook social Plugin that will cover overall comments, likes, shares of your posts to your blog page and will also let users comment and like it on the blog page itself. This will increase your blog traffic along with your Facebook business page insights. It is an easier way to link your readers just because the fact that more than 600 million users online everyday. RSS- Rich Site Summary plays a vital role to your blog subscribers. Once you link your own RSS Feed to your blog, it will be much easier to your blog readers to subscribe to your blog posts. So, whenever you post a new one onto your blog, the subscribers get notified through your RSS feed. If you use wordpress hosting, RSS will be developed automatically, and you just need to link it with the feed whether it is through feedburner or atom or if any. This plug-in is an important asset to a blog. Lets say, When a reader visits your blog once for the first time through search, if you have the popular posts on your blog that are related to the one they are reading, they might want to check it too ending up in spending some more time in your blog. If they like the content, chances are subscribing to your blog. All the wordpress blogs allows comments., some blogs allow only after logging in and some allow using social plug-ins etc.. Nobody wants to login to a site and comment on it. Mostly, readers will not spend time in signing in to comment for a post. There are awesome comment plugins out there like CommentLuv, JetPack etc., that will help you to make your comment options very attractive and useful to your readers to comment on your blog. There are so many wordpress plug-ins that is must for a blog to survive on the Blogging world. Install wordpress plugins for mail sending like Mailchimp, Aweber etc., SEO plugins, and most importantly Guest Post plugin. This plugin is important because when another blogger visits your blog and interested in doing a Guest Post, it is useful to get your guest posts ready. And Guest Blogging is essential to every blogger for his own blog's growth and for his own name to grow among the leading blogger's lists. The Shareaholic plugin provides you to share your posts to more than 100 social medias and bookmarking services. As far as considering the field of Blogging when you take it seriously and make a way to earn out of it, you have to be well connected to all the means of marketing, promoting your blog. You need to have most of the plug-ins that you could make use of within your blog. Please share the names of the most used plugins in your blog with us that helps you run your blog in an efficient way. Employers are increasing using social networking sites to attract and recruit candidates and to accept applications for employment. Here's how to get started on social networking for job seekers.